I love brussel sprouts. When people tell me they aren’t a fan, I always ask why and the most common answer is that the sprouts they usually eat are over cooked. Yes, over cooked brussel sprouts are not the most palatable. More often than not, they are boiled and become too soft and soggy, without any flavor or texture. Even when sautéing, you run the risk of them steaming from their own moisture. So… why not avoid it all together and serve these wonderful little baby cabbages (ok, brussel sprouts aren’t technically baby cabbages, but they are in the same family so close enough) raw and avoid the whole over-cooked-ness of it all completely! One thing though: since the leaves are fibrous, they will have to marinate for a while so keep that in mind when timing your meal. 1. Wash the brussel sprouts, then trim off the ends and remove any leaves that are discolored or damaged. 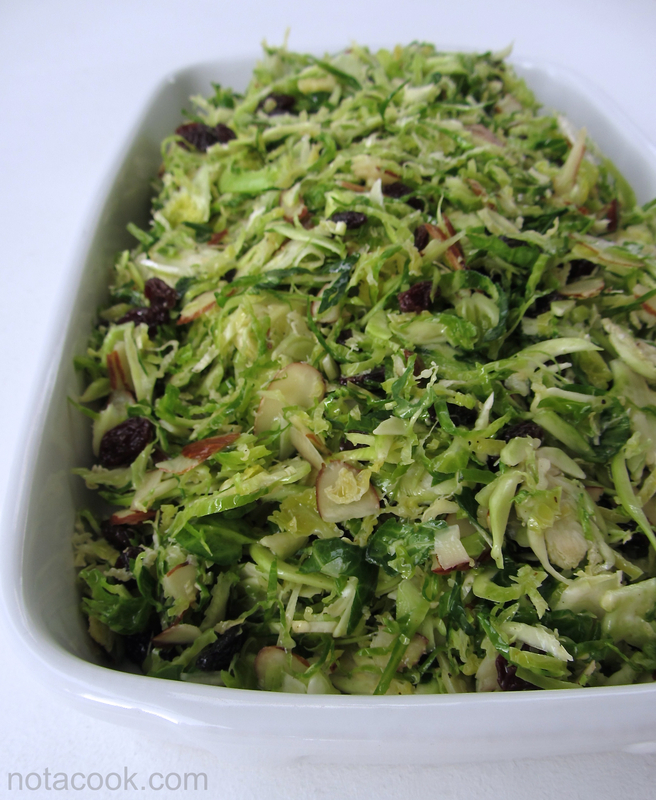 Shred the sprouts using a food processor, or thinly slice with a knife or mandolin. Transfer shredded sprouts to a large mixing bowl. 2. Prepare the dressing. In a small bowl, whisk together the cider vinegar, maple syrup, mustard, lemon juice, and cayenne pepper. While constantly whisking, slowly add in the extra virgin olive oil and continue to whisk until dressing is emulsified. 3. Pour dressing over the shredded brussel sprouts and toss to evenly coat. Set aside and allow to marinate for 30 minutes. 4. Toss in the raisins and almonds. Season to taste with salt and pepper. Ooo! I like this. Thanks! I have come to really like raw brussel sprouts since trying the Sweet Kale Salad Mix from Costco. Your recipe may end up in my “KEEP” file instead! Reblogged this on Arts, Crafts, Food and Things.